Aleta Meadowlark enjoys both omming and nomming. So tell me, what can I do for you? on twitter, cheerfully distributing ad hoc cooking & baking advice for free. on facebook, so you can become a fan and everyone will know that you have great taste in food blogs. reference: how much do herbs & spices weigh? 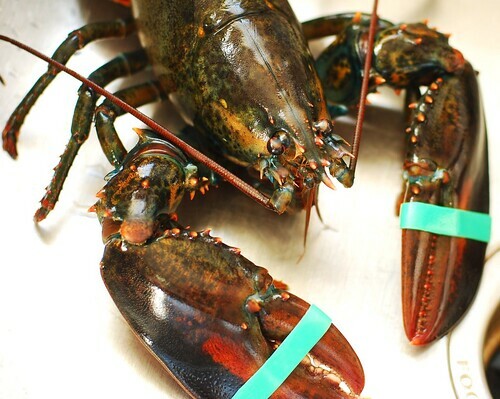 Every winter when I feel like I’m particularly broke and miserable and I just want it to end, I head to the local fishmonger and blow a bunch of money on a lobster that is completely out of season. 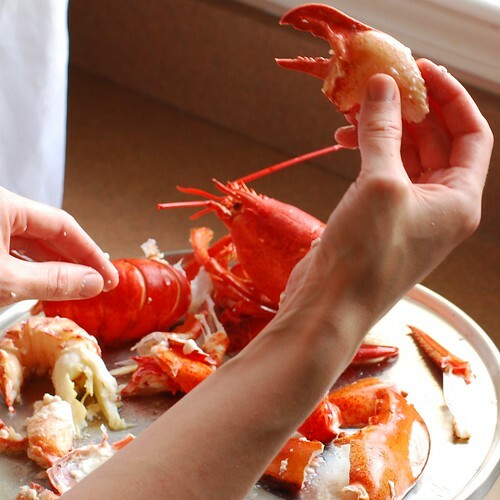 This entire practice is just so indicative of someone who is a complete New Englander, what with our long snowy winters and delicious lobsters. 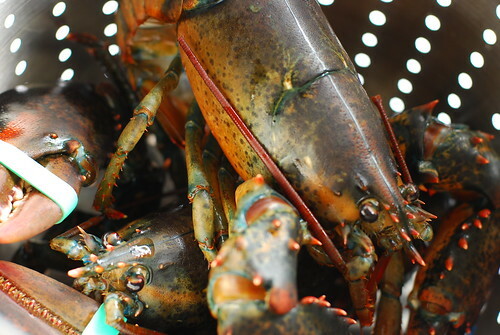 Lobsters aren’t seasonal per se, but they are much cheaper between Memorial Day and the Fourth of July. 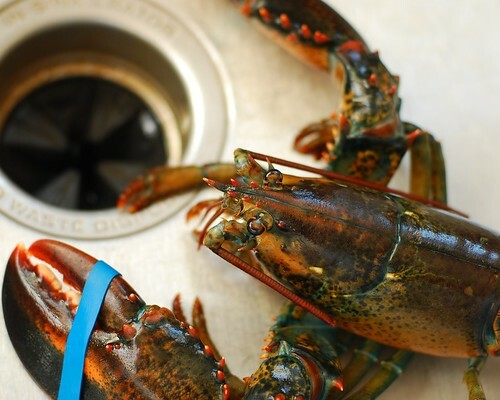 The truth is, however, that hard shell lobsters are most easily found in the Spring. 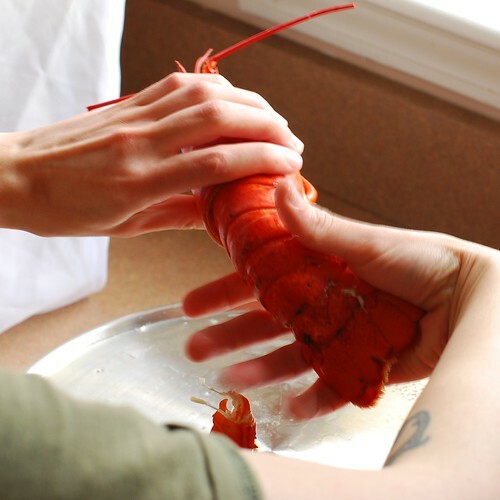 There is lots of information all over the internet as to why this is, but all you need to know is that a hard shell lobster feels firm when you squeeze slightly and makes for less chewy meat. Armed with this information, I figured that making these in early March isn’t the worst time. 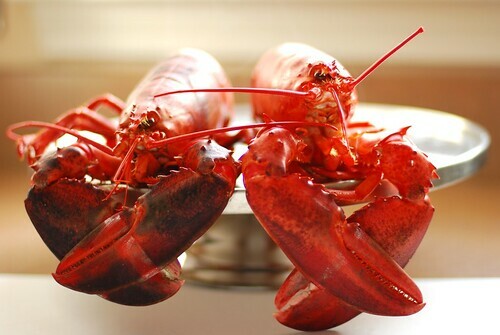 The only fresh lobsters are live lobsters, and the best ones are spritely and healthy with an ardent will to break as you steam them alive. So let’s meet the couple we’re having for dinner, bwahaha. And yes, I mean that in a creepy Vincent Price sort of way. This is Shelly, for obvious reasons. They became great friends when they were roommates in that tank. Alright ladies, get comfortable in that strainer. 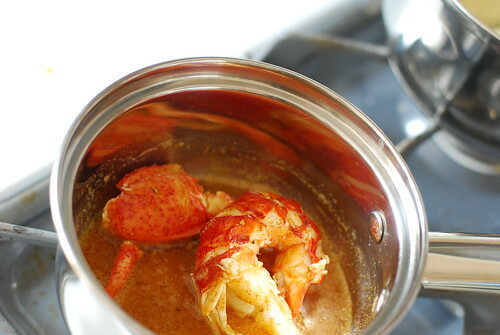 We don’t boil lobsters around here, we steam them, because boiling a huge pot of water takes for-freakin-ever, and steaming results in a less water-logged shell. Just an inch of water in a huge pot does the trick. 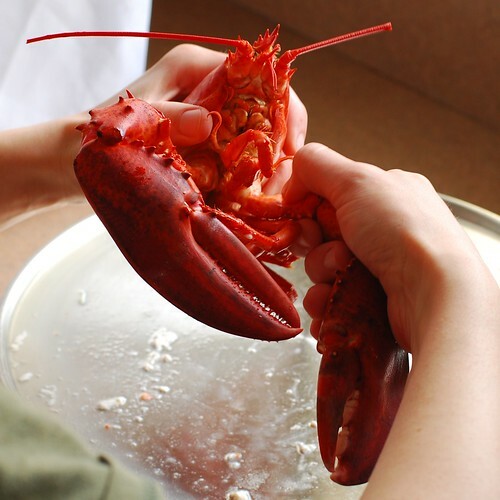 Then steam for awhile depending on the pounds of lobster—for two 1.25 lb lobsters this amounts to about 12 minutes. You’ll need an unnaturally large pot. And look! One of the prettiest colours in New England. As with all delicacies, there is a catch. 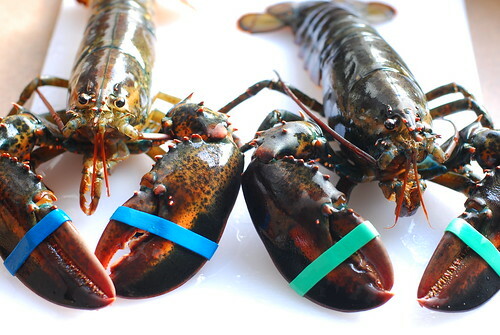 If you aren’t disgusted by the spiderlike appearance of these ocean bottom dwellers, you probably still understand that disassembling a lobster can be quite the undertaking without a good plan of attack, but it’s actually easier than it would seem with some handy instructions. First, twist off both claws. Now twist off the tail. Tail meat is a cinch, you just pull off the flippers at the end of the tail and insert your finger there to push out the meat from the top. This picture doesn’t illustrate it very well, but that’s the deal. The claws are the real tough part here. They require a lobster cracker and I use a pair of kitchen scissors (ones I don’t mind putting in the dishwasher after the fact) to help myself out. 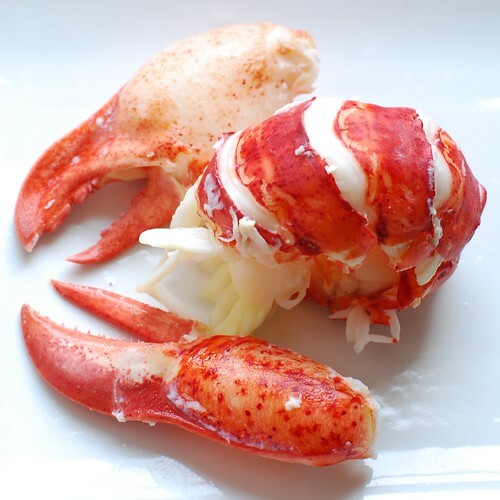 Lobster meat is much more lovely away from all that mess, and after being rinsed in room-temperature water. 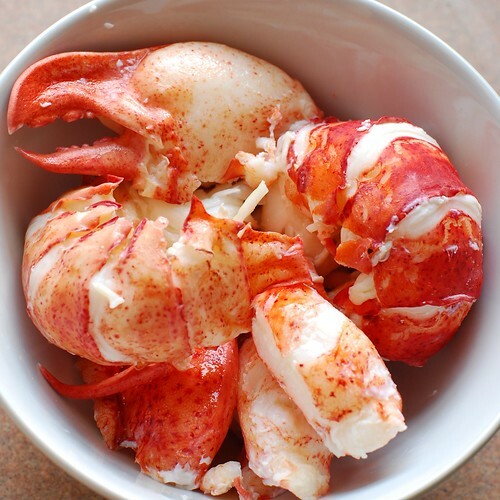 Every time I’ve had lobster at home I’ve pulled it apart and tossed the meat into a bowl of melted butter as I went. By the time I was done the corn on the cob had cooled and soon my chin was dripping with butter as I sighed satisfied with eyes closed and a crustacean appendage entering my mouth. I understand that this scenario is only appealing to people who have experienced it, and I apologize for grossing out everyone else. 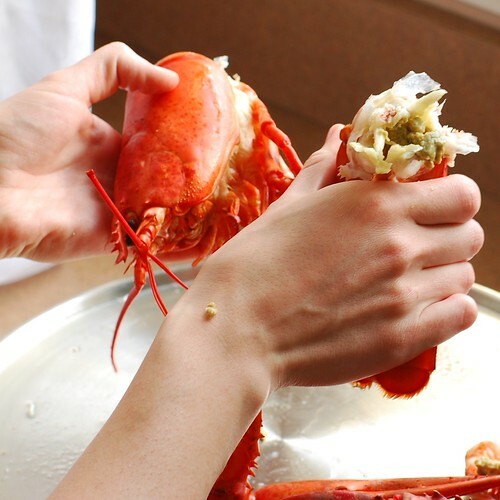 Before the cream is added, we coat our lobster bits with spices and butter. 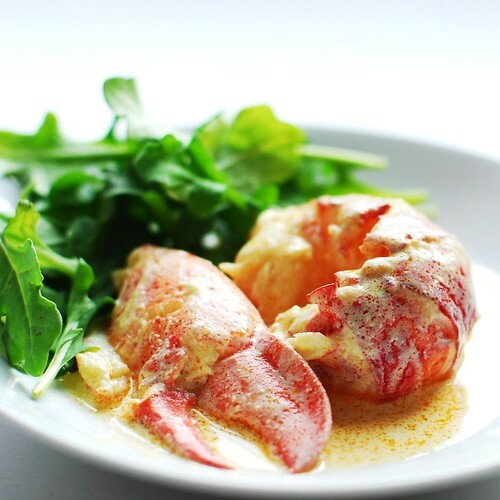 Finally, the cream part comes into play and we serve the Lobster Newburg with arugula, which has a peppery taste that complements the sauce SO WELL. In fact, I ate this a lot like a salad. But the traditional garnish is watercress and baby spinach would work as well. 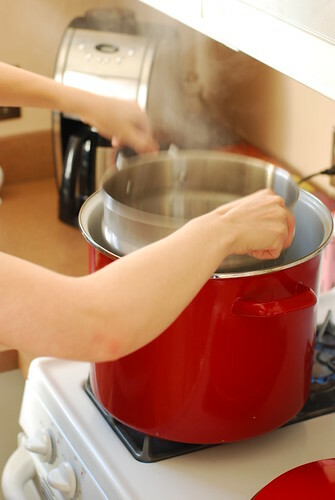 Fill your largest pot with about an inch of water and bring to a boil. 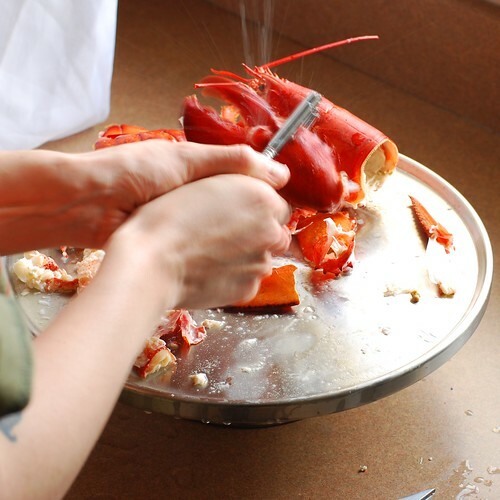 Using either a rack that fits in over the water line or a steaming basket, place the lobsters in the pot, tail down first, and lid immediately. 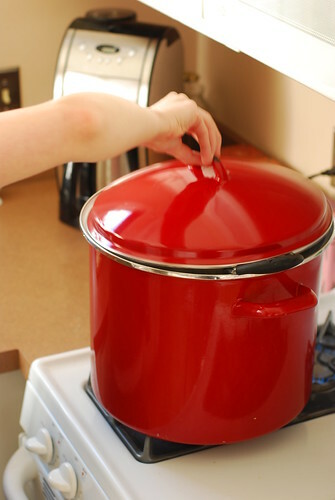 Continue to boil over high heat for 12-15 minutes. 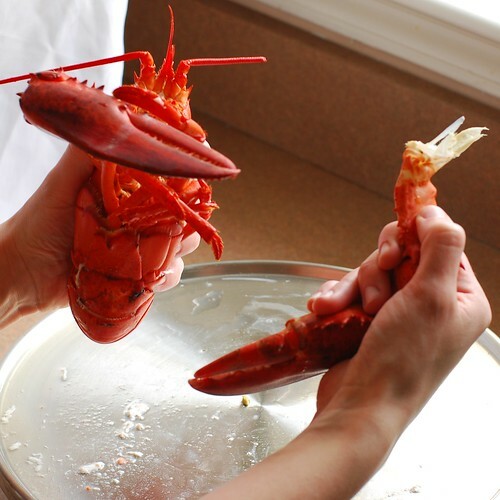 If you don’t have a rack or steam basket, you can put the lobster right in the water, but keep an eye on those claws and make sure they don’t get black, which means they’re overcooked (yes, one of my lobsters in the picture was overcooked, it was the one on the bottom). Heat the half and half in pan over medium heat, making sure not to scald it. Meanwhile, whisk the egg yolks with salt and sherry. Add the egged-sherry to the half and half, whisk, and cook over low heat until thickened enough to coat a spoon. This should take 6-8 minutes. 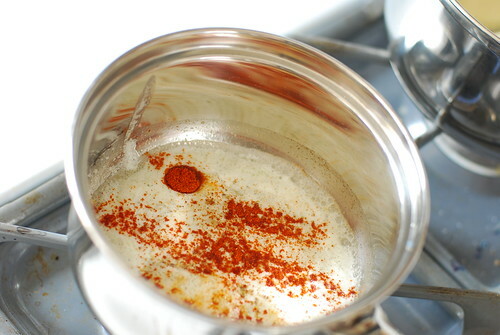 In another saucepan, melt the butter over low heat and add paprika and pepper. 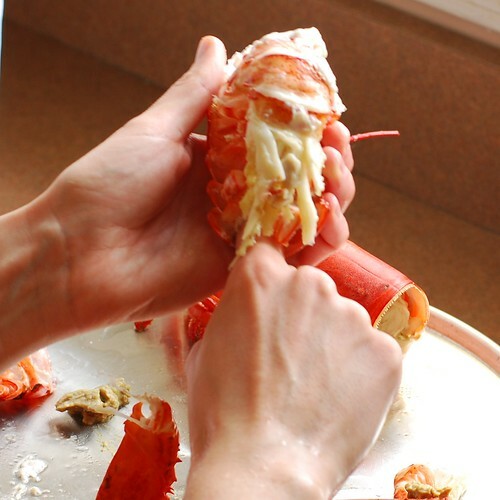 Add lobster meat to coat, then pour the cream/sherry mixture and heat thoroughly. Serve with arugula, watercress or baby spinach. Melt into a puddle of satisfaction.